Do Control decks that Token Druid goes up against ever have any minions on the board at all? I see the potential. But the odds of having both biology projects and this in your hand by turn 1 is pretty rare. 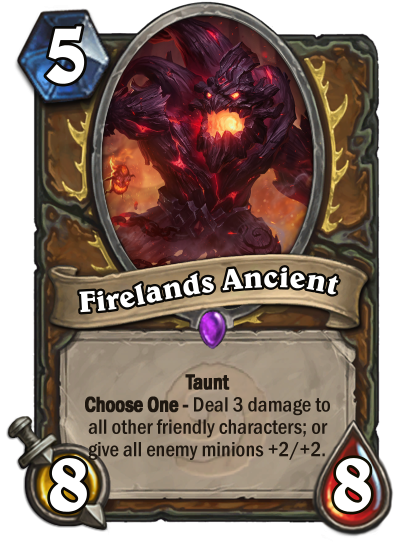 If i were to compare this to anything, mountain Giant being played on turn 3. Yes it doesn't have taunt, but you wouldn't want to ignore something like that anyways, practically giving it taunt in some regard. You can say so about any other druid card, yes, but this is 5 mana 8/8 with Taunt (8 mana minion) with downside which is negated if you don't have any other minions and for ramp into this it is really probable. Can't you say that about any druid cards and their big minions tho?